Theileria and Anaplasma are especially important emerging tick-borne pathogens of animals and humans. Molecular surveys and identification of the infectious agents in Mongolian gazelle, Procapra gutturosa are not only crucial for the species’ preservation, but also provide valuable information on parasite and bacterial epidemiology. A molecular surveillance study was undertaken to assess the prevalence of Theileria spp. and Anaplasma spp. in P. gutturosa by PCR in China. Theileria luwenshuni, A. bovis, A. phagocytophilum, and A. ovis were frequently found in P. gutturosa in China, at a prevalence of 97.8%, 78.3%, 65.2%, and 52.2%, respectively. The prevalence of each pathogens in the tick Haemaphysalis longicornis was 80.0%, 66.7%, 76.7%, and 0%, respectively, and in the tick Dermacentor niveus was 88.2%, 35.3%, 88.2%, and 58.5%, respectively. No other Theileria or Anaplasma species was found in these samples. Rickettsia raoultii was detected for the first time in P. gutturosa in China. Our results extend our understanding of the epidemiology of theileriosis and anaplasmosis in P. gutturosa, and will facilitate the implementation of measures to control these tick-borne diseases in China. Theileria is mainly transmitted by tick vectors and cause heavy economic losses to the livestock industry. The family Anaplasmataceae in the order Rickettsiales was reclassified in 2001, and includes several genera, including Anaplasma, Ehrlichia, Neorickettsia, and Wolbachia. Of them, the genera Anaplasma and Ehrlichia are especially important as emerging tick-borne pathogens in both humans and animals . Anaplasma phagocytophilum is the causative agent of human granulocytic anaplasmosis, an extremely dangerous disease associated with high mortality rates in humans -. Other Anaplasma spp., such as A. bovis, A. ovis, A. marginale, and A. centrale, infect the erythrocytes and other cells of ruminants ,. Anaplasmosis is endemic in tropical and subtropical areas, but is also frequently reported in temperate regions. Six or seven Anaplasma species have been reported in North America, Europe, Africa, and Asia -, and some have also been reported in sheep, goats, and cattle throughout China ,,. The detection and isolation of Theileria and Anaplasma require specialized laboratories staffed by technicians with a high degree of expertise, primarily because the species’ life cycles are intracellular. Several sensitive molecular tools, such as PCR, have been used to detect and identify Theileria and Anaplasma species in both hosts and vectors -. The Mongolian gazelle, an endemic ungulate species designated a threatened species by the World Conservation Union, is facing human and livestock disturbances of varying intensity in northern China. Although several studies have demonstrated that various Theileria, Babesia, Ehrlichia, and Anaplasma species circulate among sheep, goats, cattle, cervids, and humans in China, almost no data are available on the possible role of P. gutturosa as a host organism. The aim of this study was to detect and identify Theileria and Anaplasma spp. in P. gutturosa, a potential natural host of animal theileriosis and anaplasmosis in China. The region investigated in China is located at latitudes 35°03′–35°55′ north and longitudes 105°37′–108°08′ east. The study was performed in April 2014. A total of 92 blood samples were collected randomly from P. gutturosa, and 242 ticks were collected from both P. gutturosa and grass in its environment. Of them, 30 unfed adult ticks were collected directly from grass in the gazelles’ environment; 212 engorged nymph ticks collected from P. gutturosa were kept at 28°C and 80-90% relative humidity during molt, until nymph ticks were molted into adult ticks. All of adults were identified with Teng’s methods . Blood smears were prepared from the ear blood of every P. gutturosa individual. During the blood collection process, cases of suspected theileriosis or anaplasmosis were investigated. Theileriosis and/or anaplasmosis should be suspected in tick-infested animals with fever, enlarged lymph nodes (theileriosis only), anemia, and jaundice. The blood smears were air-dried, fixed in methanol, stained with a 10% solution of Giemsa in phosphate-buffered saline (pH 7.2), and then analyzed microscopically and photographed (Figure 1). Theileria (A) and Anaplasma (B) in the blood smears from Mongolian gazelle. Genomic DNA was extracted from the 92 whole blood samples and 222 tick samples using a genomic DNA extraction kit (Qiagen, Hilden, Germany), according to the manufacturer’s instructions. The DNA yields were determined with a NanoDrop 2000 spectrophotometer (Nanodrop Technologies, Wilmington, DE, USA). PCR was used to detect and identify Theileria and Anaplasma spp. in P. gutturosa with the species-specific primers shown in Table 1,,-. The PCR reactions were performed in an automatic DNA thermocycler (Bio-Rad, Hercules, CA, USA) and the PCR products were used to assess the presence of specific bands indicative of Theileria and Anaplasma. The DNA fragments were sequenced by the GenScript Corporation (Piscataway, NJ, USA). Representative sequences of the 18S rDNA/16S rDNA (or msp4) genes of the Theileria and Anaplasma spp. newly identified in this study were deposited in the GenBank database of the National Center for Biotechnology Information (NCBI) (http://www.ncbi.nlm.nih.gov/genbank/). The MegAlign component of the Lasergene® program version 4.01 (DNASTAR) was used to generate multiple sequence alignments with the ClustalW algorithm (www.clustal.org/) and for the phylogenetic analyses using the neighbor-joining method. A phylogenetic tree was constructed (Figure 2) based on the Theileria and Babesia 18S rDNA gene sequences determined in this study, and others obtained from the GenBank database under accession numbers: KM186951–KM186957, AY262118, JX469515, JF719832, AY661512, JF719834, EU274472, EU277003, AY260172, FJ603460, AY726011, KJ188212, EU083800, FJ426369, AY262120, KJ188228, Z15105, AY081192, AY260179, AY260176, GQ304524, AY260178, and HQ264112. Another phylogenetic tree was constructed (Figure 3) based on sequences of the Anaplasma and Ehrlichia 16S RNA genes under the following accession numbers: KM186935–KM186937, KM186940, KM186944, KM186947-KM186950, KM246795, KM246796, KM227012, HQ913644, HM131218, JX092094, JN558819, AY077619, EU439943, KM246802, AB196721, AY837736, KC484563, KJ639880, JQ917879, AF414869, NR_074356, KC479022, KC479024, and KJ659037. Phylogenetic tree of Theileria and Babesia based on 18S rDNA sequences. Phylogenetic tree of Theileria and Babesia based on 16S rDNA sequences. This study was approved by the Animal Ethics Committee of Lanzhou Veterinary Research Institute, CAAS (No. LVRIAEC2013-010). The use of these field samples was approved by the Animal Ethics Procedures and Guideline of China. In this study, all 242 ticks were collected from P. gutturosa or grass in its environment in north-western China. The identification result showed that the adult ticks were either Haemaphysalis longicornis (n = 130: 86 female; 44 male) or Dermacentor niveus (n = 112: 78 female; 34 male). The whole DNA of 120 H. longicornis ticks and 102 D. niveus ticks was extracted. Theileriosis and anaplasmosis was present in 50% of the gazelles tested (46/92). Theileria and Anaplasma infections were observed microscopically in 87.0% (80/92), and 13.0% (12/92) of the blood smears from P. gutturosa individuals, respectively (Figure 1). All infected animals exhibited low levels of parasitemia, with 0.01–6% for Theileria and 0.01–4% for Anaplasma. PCR analysis revealed that the prevalence of T. luwenshuni, A. bovis, A. phagocytophilum, and A. ovis in P. gutturosa was 97.8%, 78.3%, 65.2%, and 52.2%, respectively. Their prevalence in H. longicornis was 80.0%, 66.7%, 76.7%, and 0%, respectively, and their prevalence in D. niveus was 88.2%, 35.3%, 88.2%, and 58.8%, respectively (Table 2). No Babesia sp. was found in P. gutturosa, H. longicornis, or D. niveus. Only one (4.3%) of the 92 samples from P. gutturosa was positive for R. raoultii. The nearly full-length 18S rDNA sequences of T. luwenshuni were 1745 bp with the primers A/B, and the accession numbers are KM186951–KM186957. The nearly full-length 16S rDNA sequences were 1457 bp in A. bovis (KM186936–KM186944), 1458 bp in A. phagocytophilum (KM186947–KM186950), and 1456 bp in A. ovis (KM246795 and KM246796) with primers EC12/EC12A, which are specific for Anaplasma and Ehrlichia spp. An unknown Anaplasma sp. was isolated and its accession number was KM227012. The msp4 gene PCR products were 551 bp for A. bovis (KM226988, KM226999, KM227002, and KM227003), 641 bp for A. phagocytophylum (KM227007–KM227009), and 347 bp for A. ovis (KM227005 and KM227006) when species-specific primers were used. 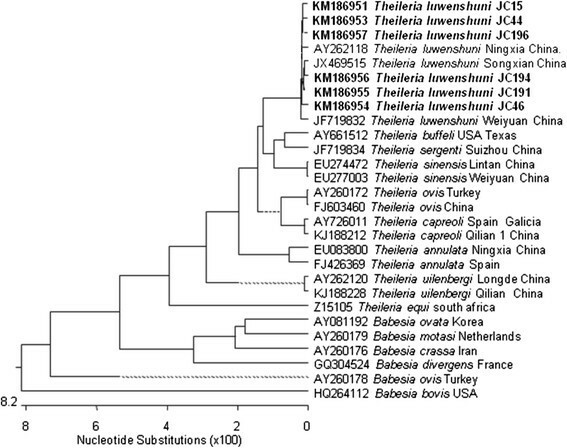 The phylogenetic tree based on the Theileria and Babesia 18S rDNA sequences showed that only one pathogen was detected, which was placed in the T. luwenshuni cluster (Figure 2). 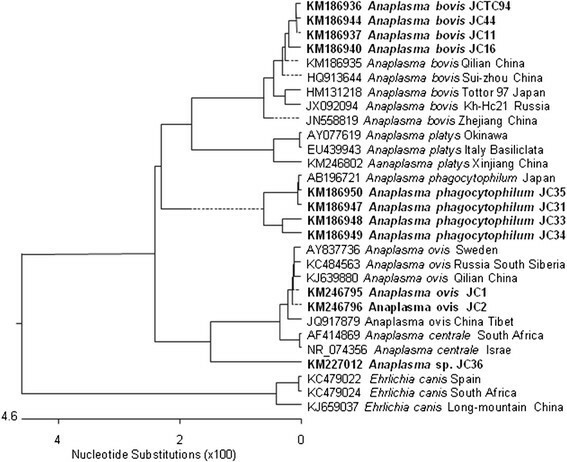 The phylogenetic tree based on the 16S rDNA sequences of Anaplasma and Ehrlichia revealed four pathogens existed and they were A. bovis, A. phagocytophilum, A. ovis, and Anaplasma sp., respectively, in the blood samples from P. gutturosa roaming northern China (Figure 3). To the best of our knowledge, this study is the first to report the prevalence of theileriosis and anaplasmosis in P. gutturosa in China. Molecular screening of P. gutturosa in northern China showed that the most prevalent Theileria and Anaplasma species were, in descending order: T. luwenshuni > A. bovis > A. phagocytophilum > A. ovis. No other Theileria sp. or Anaplasma sp. was detected in P. gutturosa. The prevalence of T. luwenshuni and A. bovis in P. gutturosa was higher than their prevalence in H. longicornis or D. niveus. However, the prevalence of A. phagocytophilum was, in descending order: D. niveus > H. longicornis > P. gutturosa. We speculate that persistent pathogen reservoirs with high infection rates are well established in P. gutturosa in northern China. Anaplasma bovis infections of cattle have been reported predominantly in African countries, and there have been few reports of bovine A. bovis infections in China. Recently, A. ovis and A. bovis were reported in goats in central and southern China, and A. marginale was detected in cattle in southern China . A. bovis and A. ovis have also been reported in red deer, sika deer, and D. everestianus in north-western China . In Japan, A. bovis and A. centrale have been detected in wild deer and H. longicornis ticks on Honshu Island, Japan ; A. bovis and A. phagocytophilum were initially detected in cattle on Yonaguni Island, Okinawa, Japan . Therefore, H. megaspinosa is considered a dominant vector tick species for both these species in cattle in Japan . In this study, four Anaplasma spp. (A. bovis, A. ovis, A. phagocytophilum, and an Anaplasma sp.) were detected in P. gutturosa. Rickettsia raoultii was also detected for the first time in P. gutturosa in China. In this study, all 242 ticks were collected from gazelle or from their environment in the investigated area. They consisted of H. longicornis and D. vineus. Theileria luwenshuni and Anaplasma spp. (including A. bovis, A. phagocytophilum, A. ovis, and Anaplasma sp.) were detected and identified by PCR. Therefore, we speculate that these ticks play an important role as natural vectors of Anaplasma spp. in northern China. Theileria luwenshuni were first reported in sheep and goats, and widely distributed in north-western China ; recently, it was also reported in sheep and goats in central and southern China -. T. luwenshuni can be transmitted by H. qinghaiensis and H. longicornis in north-western China , but only H. longicornis and D. niveus were found in this study. Therefore, H. longicornis must play an important role as a natural vector of T. luwenshuni in P. gutturosa in northern China. However, whether T. luwenshuni can be transmitted by D. niveus remains to be determined. Our results provide important data that extend our understanding of the epidemiology of theileriosis and anaplasmosis, and should facilitate the implementation of measures to control the transmission of Theileria and Anaplasma among P. gutturosa and other relative ruminants in China. Clarification of the role of P. gutturosa as a reservoir host for some Theileria and Anaplasma species is critical in determining whether P. gutturosa contributes to the spread of ruminant theileriosis and anaplasmosis in China. This study was supported financially by the Natural Sciences of Foundation China (no. 31272556, no. 31372432, no. 31101621, no. 31201899), ASTIP, FRIP (2014ZL010), CAAS, Creative Research Groups of Gansu Province (no. 1210RJIA006), NBCIS (CARS-38), “948” (2014-S05), the Special Fund for Agro-scientific Research in Public Research (no. 201303035, no. 201303037), MOA; 973 Program (2010CB530206), Basic Research Program (CRP no. 16198/R0), Supporting Program (2013BAD12B03, 2013BAD12B05), Specific Fund for Sino-Europe Cooperation, MOST, China; and the State Key Laboratory of Veterinary Etiological Biology Project. The research was also supported by CRP (no. 16198/R0 IAEA) and PIROVAC (KBBE-3-245145) of the European Commission. Thanks for the revision by Edanz Group Ltd (China). QR and GG collected the samples; YL, ZC, ZL, and JL performed the molecular genetic studies; JY, QL, YL, and SC performed the sequence alignments; YL, JL, and HY drafted the manuscript. All authors have read and approved the final manuscript.